Sweet Eats Cakes LLC will be doing their first bridal show April 3rd from 1pm to 4pm at the The Inn at Roops Mill in Westminster MD. 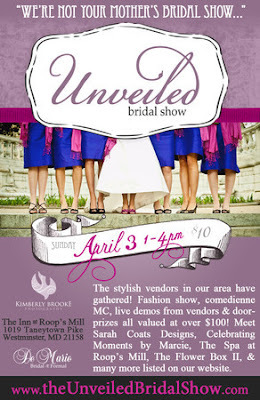 The show is hosted by DeMario Bridal & Formal Inc. , Kimberly Brooke Photography, and The Inn at Roops Mill. There will be lots of great vendors, door prizes and goodie bags for the first 25 brides! If you are local and getting married soon come check us out! ﻿Stay tuned we have lots of more great cakes to show you after we do our photo shoot this weekend!